Calibration equipment with a tool management software pre-installed. Calibration, adjustment and tool management for torque wrenches. Super wide torque range; equivalent capacity of over two units of Tohnichi DOTE models. Tool management software pre-installed; memorize model names, accuracy, direction, measuring points, etc. 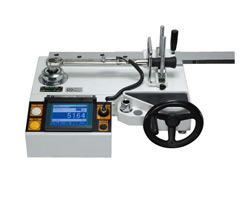 Easy-to-operate with LCD touch panel functions. PC compatible with USB memory or RS232C cable. Operating check for a torque wrench with limit switch function. Adapt the "spindle-rotating" loading mechanism. Compliant with ISO6789; 5 measuring points max, 10 measuring times max. at each point.